In my review of J.R.R. Tolkien’s translation of the Old English poem Beowulf (issue 298.1), I allude to the Oxford professor’s radical interpretations of certain sections of the poem; however, space limitations in the print magazine didn’t allow me to elaborate on those interpretations, so I spoke with the NAR editors about using their blog to further discuss Tolkien’s rebel readings. The word rebel is not used merely for dramatic effect. Scholarship devoted to Beowulf has been a thriving subculture in the academic world for more than 150 years. Opinions are often held passionately, and challenges to those opinions can be contentiously and even bitterly met. Tolkien held the post of Professor of Anglo-Saxon at Oxford University from 1925 to 1959. It was an esteemed professorship, of course, and brought with it respect, but also a host of jealous rivals. Tolkien seems to have been keenly aware of his colleagues who were ready to pounce on anything he might have to say about English literature. 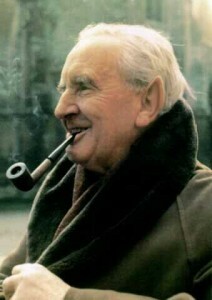 Christopher Tolkien, who prepared his father’s translation for its very posthumous publication, quotes from a letter that the professor wrote to his publisher in 1965 regarding his translation of Sir Gawain and the Green Knight: “[I]t cannot be doubted,” said Tolkien, “that the book will be read by students, and by academic folk of ‘English Departments’. Some of the latter have their pistols loose in their holsters.” Tolkien went on to say that he had “made important discoveries with regard to certain words, and some passages”. It is important to note that Sir Gawain was composed in Middle English—not Old English, also known as Anglo-Saxon—and therefore was not in Tolkien’s primary fi eld of expertise. We can imagine the profundity of the discoveries he made in his study of Beowulf, his pet project, and also the pressure he must have felt from the itchy-fingered academic pistoleers who were watching his every scholarly move. This factor combined with what Christopher Tolkien describes as his father’s determination “to make a translation as close as he could to the exact meaning in detail of the Old English poem” (8) accounts, for the work never fully reaching completion in the professor’s mind. Though a draft was finished in 1926, Tolkien continued to refine his translation, tinkering and annotating, for at least the next twenty years. Besides the professor’s expertise and his obsession to render a perfect literal translation of Beowulf, another reason to pay particular attention to his reading is that he occupies a very special place in the history of the poem. It was his now-legendary address to the British Academy in 1934 (published two years later as “Beowulf: The Monsters and the Critics”) that altered the way scholars viewed the poem. In essence, interest in the poem had been primarily as a historic and linguistic artifact, but Tolkien made the case that Beowulf was a beautifully rendered piece of art by a single poet who was at the top of his game when he brought it to its final form, represented in the lone surviving manuscript dating from about the year 1000. I want to speak in particular to two of Tolkien’s rebel readings. As I noted in my review, the translation itself takes up just over 100 of the book’s nearly 450 pages. Tolkien’s lectures, or commentaries, on the poem—though only a small excerpt, according to his son—constitute the lion’s share of the book. Several pages of commentary are devoted to explaining the professor’s first rebellious passage, which comes early in the poem (lines 166-69 in the original). After the monster Grendel has begun his murderous assaults on King Hrothgar’s hall, Heorot, the Danes try to save themselves by abandoning Heorot at night. In the conventional rendering of the poem, we are told that Grendel often visits the empty hall but is prevented by God from approaching the king’s throne. In Michael Swanton’s well-respected prose translation of Beowulf, he writes, “On dark nights he [Grendel] dwelt in the treasure-decked hall, Heorot. Because of Providence he could not approach the precious throne, the source of gifts; nor did he feel his love.” In his endnotes Swanton emphasizes that the passage is especially challenging. Tolkien read the passage very differently. 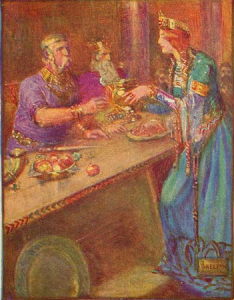 Because the poem was composed by a Christian poet who was telling a tale of pre-Christian people (a juxtaposition that is made clear at several points in the poem), the professor believed that it was Hrothgar who was not allowed to approach “the precious Throne of grace” (17), with Throne being a metaphor for the Christian God’s love. In other words, Hrothgar wasn’t able to seek solace in God’s love in his people’s time of need because he had the misfortune of living before Christianity made its way to his part of the world. Tolkien writes in full, “Heorot’s hall bright with gems in the dark night he [Grendel] dwelt. (Never might he [Hrothgar] approach the precious Throne of grace in the presence of God, nor did he know His will). That was great torment to the Scyldings’ lord [Hrothgar], anguish of heart” (17-18). 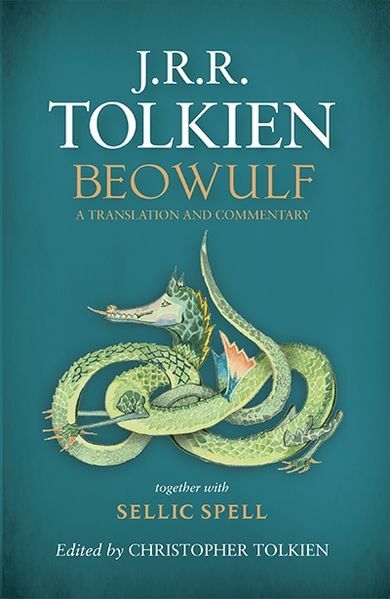 In his commentary, Tolkien calls lines 168-69 “perhaps the most difficult [couplet] in Beowulf” (181), and not because they are corrupted due to physical damage or faulty emendation, but because one must bring to bear on them an extensive knowledge of Old English (including the work of Cynewulf, another Anglo-Saxon poet) combined with a firm grasp of their historical context in order to make accurate sense of the Beowulf poet’s meaning. The other rebel reading that I want to discuss is especially important to me because it substantiates my own unconventional reading of one of the poem’s final images. In the summer of 2012, I was working on my monograph, The Beowulf Poet and His Real Monsters, and translating passages in an effort to support my trauma-theory analysis of the poem. I was interested in the female mourner at Beowulf’s funeral who appears in lines 3150-55a, just thirty lines from the end. The typical translations of the passage describe her as a woman or, frequently, a n old woman who is devastated at the loss of her king and the thought of the coming attacks by the Swedes and others. My translation went unchallenged when the book came out in 2013 and was reviewed by eminent Beowulf scholars, including Robert E. Bjork and James W. Earl. Nevertheless, I was surprised and pleased when I read Tolkien’s translation in May of 2014 and came to the passage “There too a lamentable lay many a Geatish maiden with braided tresses for Beowulf made, singing in sorrow, oft repeating that days of evil she sorely feared, many a slaying cruel and terror armed, ruin and thraldom’s bond” (104-5). So Tolkien, too, saw her as young and virginal. Unfortunately, Professor Tolkien doesn’t speak to this reading in his commentaries, but in Christopher Tolkien’s “Notes on the Text of the Translation” he explains that his father originally went with “his lady aged” for the female mourner but changed his mind in what became the final version of the translation’s manuscript with no direct explanation for his revision. Christopher infers that his father had been tempted to force a reading onto the passage that he was attracted to for other than philological reasons (128-30). My hope is that Tolkien’s lectures will be published in their entirety as they would be an invaluable resource to scholars and serious students of not only Beowulf but Old English literature as a whole. 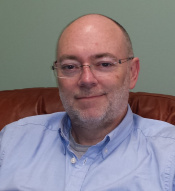 Ted Morrissey is the author of The Beowulf Poet and His Real Monsters, winner of the D. Simon Evans Prize for distinguished scholarship, as well as the novels Men of Winter and An Untimely Frost, and, most recently, the novella Weeping with an Ancient God. Visit at tedmorrissey.com.